VATICAN CITY (CNS) — A Vatican official said an intergovernmental pact can help countries address the current migration crisis through dialogue and concrete solutions rather than confrontation and fear. 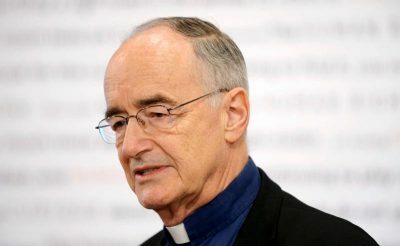 Jesuit Father Michael Czerny, undersecretary of the Migrants and Refugee Section of the Vatican Dicastery for Promoting Integral Human Development, said the Catholic Church is doing all that it can to help welcome, protect, promote and integrate migrants in countries where the U.N. Global Compact on Migration is formally adopted. Father Czerny was among several experts who spoke about the global compact, which will be formally adopted at an international conference in Marrakesh, Morocco, Dec. 10-11. Also present were Anne T. Gallagher, president of the International Catholic Migration Commission, and Stephane Jaquemet, policy director for the commission. The Vatican contributed to the negotiations leading to the agreement and prepared a 20-point action plan that included concrete proposals to help governments improve the situation of migrants and refugees. “This is already a step that isn’t left within the confines of the church, but we wanted to bring this treasure and this hope within the process of consultation and negotiation,” he said. Father Czerny said the Vatican was pleased to see that the compact not only “reflects on important points in our document, but also the approach, the style and methodology” based on the church’s principles and values. “We are happy for this success in a fragmented world,” Father Czerny said.